Animal-assisted therapists include direct animal contact as part of their treatment plans for patients. Therapists using this technique often are mental or physical health care professionals who use animals as one component of their comprehensive treatment plans. These types of therapists carefully integrate animals into clients' sessions when appropriate, supervising the animals as the interactions take place. 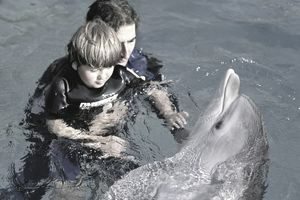 Depending on the goals of the therapy session, the animals might help provide physical contact and affection to clients, ease anxiety issues, increase the physical mobility of clients through direct handling, provide a topic of conversation, or give clients an incentive to attend counseling sessions. Dogs are most frequently used in animal-assisted therapy (AAT), but other types of animals also have been successfully integrated into AAT programs. Cats, rabbits, horses, dolphins, and many other species can be beneficial in specific therapy settings. Individuals working in AAT must have access to animals that are comfortable with unfamiliar people and new surroundings. Animals must be friendly, well trained, and (if possible) certified for therapy work through a program like the AKC’s Canine Good Citizen program, Pet Partners, or another similar organization that screens and verifies an animal’s suitability for this type of interaction. Therapists also need to consider any potential liability issues and seek additional insurance if the animal-assisted therapy will not be covered under current policies. Mental Health Therapy: Psychologists or psychiatrists who provide counseling services for patients are a common source for AAT programs. Animals can serve as icebreakers when therapists and patients are first getting to know one another, and patients who develop a bond with the animal might be more comfortable in the setting and more willing to continue therapy. Education: Much like therapists, school counselors may find that animals help them connect with students and that students may be more willing to reach out to the therapists when necessary. According to the Alliance of Therapy Dogs, animals also help improve cognitive skills and self-esteem. Some teachers may use them in their classrooms as well. Eldercare: In the 19th century, Florence Nightingale wrote about the benefits of incorporating animals into treatments for patients, noting the impact they have in raising spirits and reducing feelings of anxiety. And the benefits are not age-specific, so AAT programs also can benefit those who wish to pursue a career assisting the elderly. Other professions where there is potential for AAT programs include physical therapy, occupational therapy, nursing, social work, speech-language pathologists, and recreation therapy. Animal-assisted therapists may work in hospitals, nursing homes, physical or occupational therapy facilities, correctional institutions, mental or behavioral health facilities, schools, private health care offices, and other similar locations. Some may choose to focus primarily on animal-assisted therapy and open an office that specializes in such interactions. While there is no single accrediting body for animal-assisted therapy, many ​certification programs ​are available to people interested in the field. Some of the certification programs involve direct on-campus training, others offer a distance learning (online) option, and a few offer a combination of on-campus and online work. Most programs do not require any specific educational background for applicants, but some require an undergraduate degree. Many animal-assisted therapists already hold an advanced degree in an area such as psychology, psychiatry, education, rehabilitation therapy, occupational therapy, or other health care fields. According to psychology-careers.com, several nonprofit organizations provide training and certification. These include Pet Partners, Paws for Friendship, Professional Association of Therapeutic Horsemanship International (PATH), and Intermountain Therapy Animals. Income for animal-assisted therapists is directly tied to their primary area of employment. According to Bureau of Labor Statistics (BLS) data from the most recent survey in 2017, psychiatrists earned an average annual salary of about $216,000. For physical therapists, the average is about $88,000, while occupational therapists earn about $84,000 annually, and psychologists earned an average annual salary of $82,000. Any of these career paths—and many more—could integrate animals into their treatment plans. Adding animal-assisted therapy may not directly increase the provider’s salary, but it could have a positive impact by expanding the services and reputation of providers' businesses. Most careers that can benefit from an integration of animal-assisted therapy (psychology, therapy, health care) are expected to grow faster than the average for all professions for the decade from 2016 through 2026, according to the BLS. The number of individuals pursuing animal-assisted therapy certification also has shown steady growth, a trend that is expected to continue for the foreseeable future. For those not looking for a career, there are volunteer opportunities in animal-assisted activities, which is less formal than actual therapy. The Animal Behavior Institute offers training for those who would like to provide assistance to those who may benefit from interactions with animals. This volunteer work might involve something like bringing an animal to visit residents at a senior living facility or other similar location.